This summer, Brian and I have really been enjoying getting out of the city as often as possible. I feel like in summers past, we spent all of our time hanging out by the lake, sitting by the pool, walking all around the city exploring, and doing a lot of patio drinking. It’s not that we’re not doing that this summer — the patio drinking especially — but there have also been a few great weekends where we’ve gotten out of the city and breathed the fresh air, and it’s been fantastic. The moment we clear the city limits on the highway, I feel like the world opens up and I just breathe easier. Have you seen that commercial where the couple is camping and remarking how quiet it is and how great — and then they have to turn on “city noises” on their phones in order to sleep?? That’s totally us. Even though I love leaving the city, it’s sometimes hard to adjust to the quiet. We’ve certainly had plenty of opportunities. This past weekend we drove up to my best friend’s lake house in Canada, and the relaxation came over us like water the moment we arrived. There’s something magical about the calm waters of a lake, something I never experienced growing up on the Atlantic coast. Catie’s family’s lake house is situated directly on Lake Huron, and it’s just the best. Even though the water was chilly, we played in the sand and drank local cider and ate Canadian “chips” (aka fries with vinegar sprayed on them) and basically had a ball. Can’t wait to go back next year for her wedding! I’m the maid of honor and I couldn’t be happier for her that she found the right guy. Back to our city escapes: 4th of July weekend we spent exploring the various beach towns of southwest Michigan, eating ice cream at every opportunity and doing all-American things like going to baseball games and blueberry picking. The blueberries were so cheap and so delicious when picked right off the bush! I might have gotten a little overzealous in my picking, so we wound up with a lot more than we could possibly eat before they rotted. 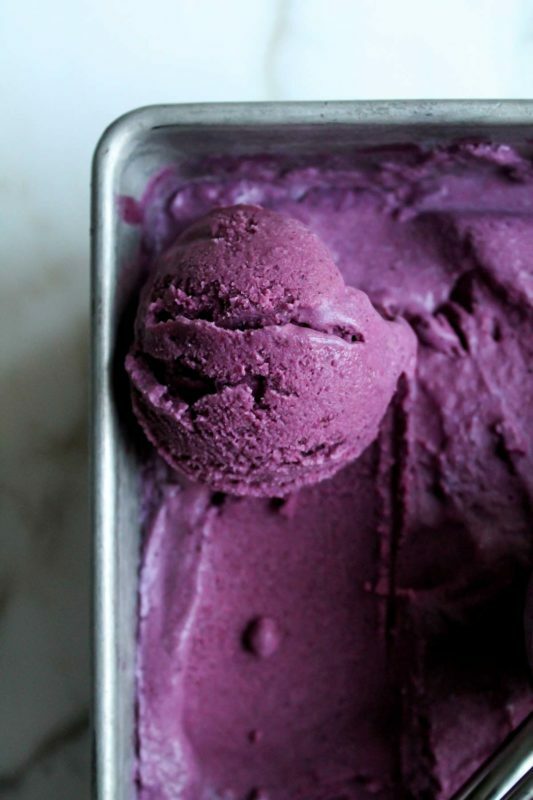 Enter one of the greatest ideas I’ve ever had (I feel like I say this every recipe but it feels true every time): to cook these little blueberries and concentrate their flavor, and then purée them into ice cream. And make it vegan. Wait…what? Don’t leave!! 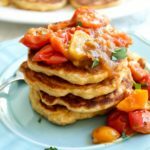 Listen, don’t discount this recipe because it’s vegan. 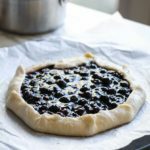 I used coconut milk and coconut cream, and I personally think the flavor really complements the blueberries. If you’re totally against it, however, you can use an equal amount of half + half and heavy cream to replace the coconut. Never fret, it will work either way. 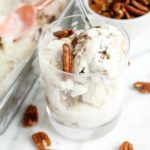 The great thing about using coconut milk and coconut cream in ice cream is that it has a high fat content, so it produces a really creamy ice cream without the need to cook a custard and all that jazz. I like to keep my ice cream easy so I can eat it faster. So I cooked the blueberries with a little sugar and lemon, then blended the heck out of them with the coconut milk/cream. That’s it. No straining, no dealing with eggs, none of that. 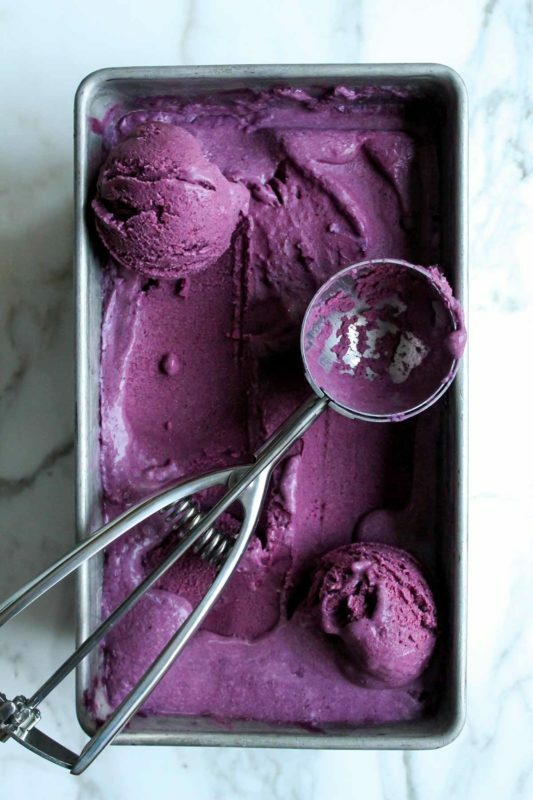 When I researched other recipes out there, they called for straining the blueberry mixture, but I wanted the full color and taste of blueberries in my ice cream. 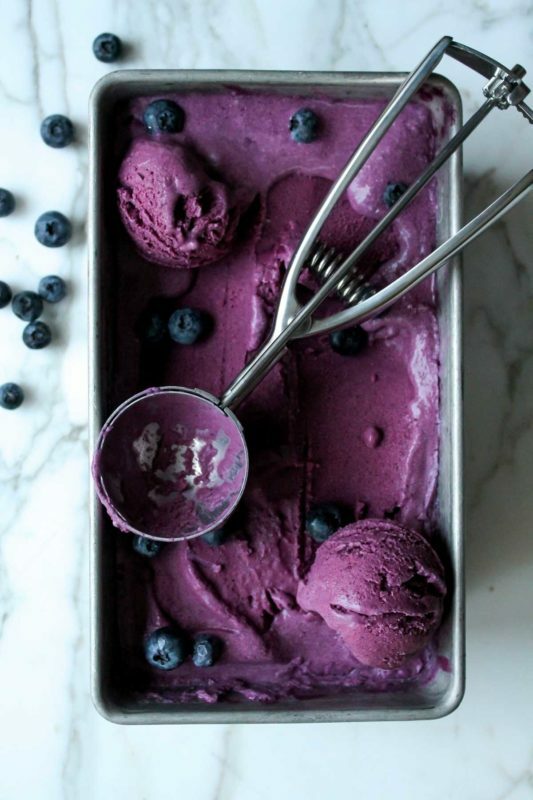 And oh man, the COLOR of this blueberry ice cream out of control! I love how vibrant it is. The photos came out a little moodier than normal for me, because by the time the finished blueberry ice cream was frozen and ready to photograph, it was nearly 8 p.m. and getting quite dark. I’m pretty ok with it this time – I think it matches the theme of this moody ice cream. 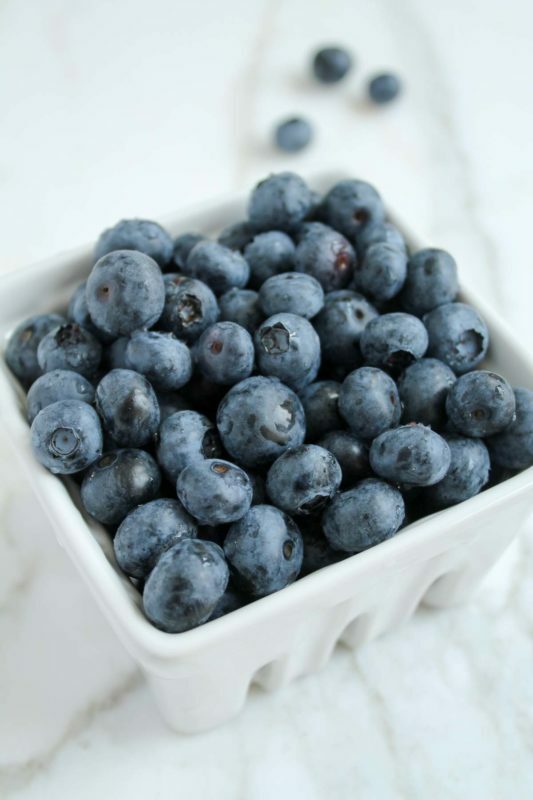 Let’s talk about flavor here: fresh blueberries are where it’s at. 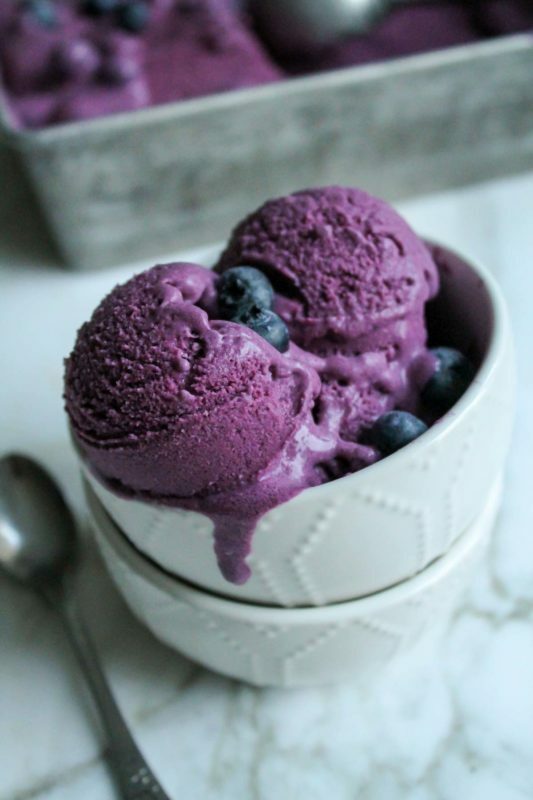 I think you could use frozen if you were in a pinch, but there’s not much that can match the flavor of fresh summer blueberries. Cooking them with sugar and lemon juice helps concentrate that bright flavor, and then blending them very thoroughly with the coconut milk is essential. I used my Vitamix and had to blend on high speed for longer than I would’ve thought necessary before I got a completely smooth mixture — so don’t get discouraged. Keep blending and it’ll all smooth out. Kind of like life, no? Here’s to getting out of the city more often, and the excellent results that come from it. 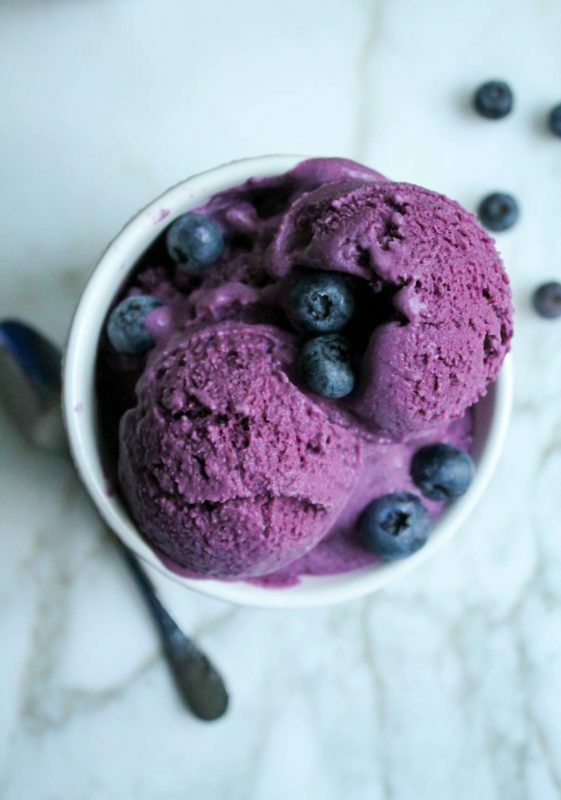 This vegan blueberry ice cream is made with fresh blueberries puréed with creamy coconut milk. The flavor is bright and full of summer. In a medium saucepan, cook the berries, lemon juice, sugar, and water over medium heat until boiling. Let boil for 3-5 minutes, stirring often, until berries begin to burst and sauce is deep purple in color. Set aside and let cool for a few minutes. 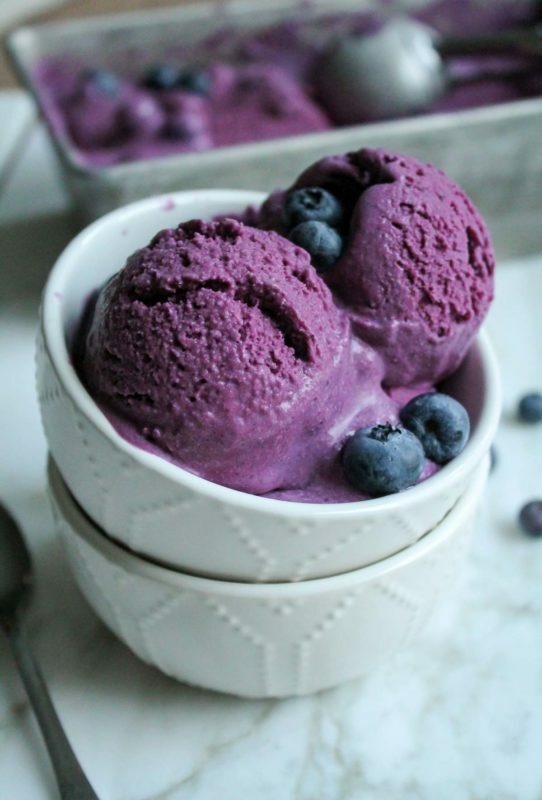 Combine coconut milk, coconut cream, cooled blueberry mixture, and vodka (optional - you won't taste it but it keeps the ice cream scoopable) in a blender and blend on high speed until fully combined and smooth. Note, this took 3-4 minutes for me - it looked a little curdled at first but just keep blending until you get a smooth mixture. Chill the blended mixture in the fridge until cold - around 30 minutes. Process cold mixture in your ice cream maker according to the manufacturer's instructions. Pour into a loaf pan or other container and freeze for at least 4 hours before scooping! 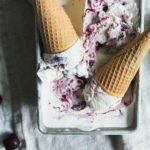 Note: if you didn't use vodka, make sure to leave ice cream out on the counter for 15-20 minutes before serving to soften. 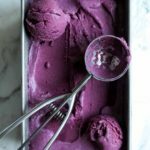 I’m kinda supprized in the recipie even with all of the blending that the blueberry skins arnt on the outside of the icecream?… ?